We were down visiting family in Greenville, Mississippi. Leroy Percy State Park was nearby and it was a treat for me to be introduced to new, southern-based species of butterflies. Phyciodes Phaon flew very low, keeping close to the edge of the lake. 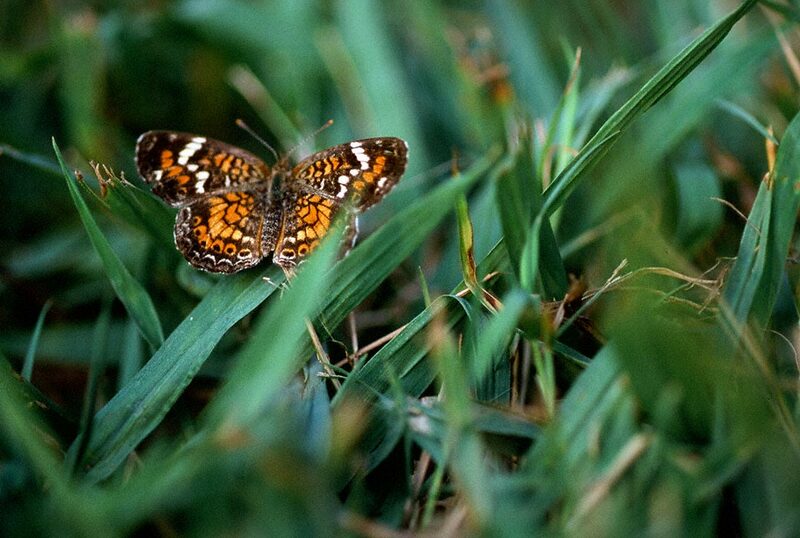 Similar to the closely related Pearl Crescent, they fly and descend on foliage, repeatedly. So we were able to photograph the Phyciodes Phaon. Our individual here I believe is a female, and sports the characteristic whitish median forewing band. Others may be creamy or yellow. A wetland butterfly, Phaon crescents never flew far from the lake shore. Phaons prefer wetland habitat. Pearl crescents don’t. Related species, different habitat. We enjoyed the hospitality of this Mississippi state park. In the west-central part of the state, it offers comfortable cabins. It’s a sight for us Pittsburghers, sitting near our cabin, at lakeside, watching the herons, egrets and alligators. Nice. Very nice. Nice shot, Jeff. I have not seen one of these. I did get a few pictures of a Pearl Crescent in my flower garden a couple of years age, but have not seen one since.